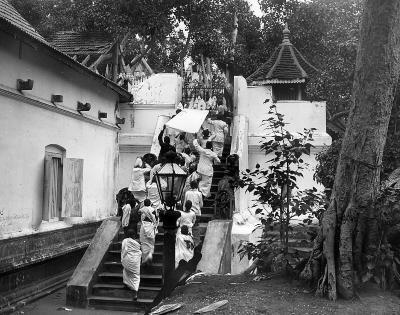 Pilgrims ascend the steps to the sacred bo tree in Anuradhapura, Ceylon (Sri Lanka). The bo tree is a cutting from the bodhi tree where Siddhartha Gautama was believed to have achieved enlightenment and become the Buddha. Brought to Sri Lanka from India in the 3rd Century BCE, the bo tree is the oldest historically documented tree in the world. It draws many Buddhist pilgrims, especially during the celebration of the Buddha’s birth in May. Photography taken in 1912.